Grey Street in Newcastle-upon-Tyne was once described by the art and architecture historian Sir Nikolaus Pevsner as “one of the finest streets in England”; and this claim is set to continue with an exclusive development by the Malhotra Group and Space Architects that will help to revitalise this magnificent part of the city centre. 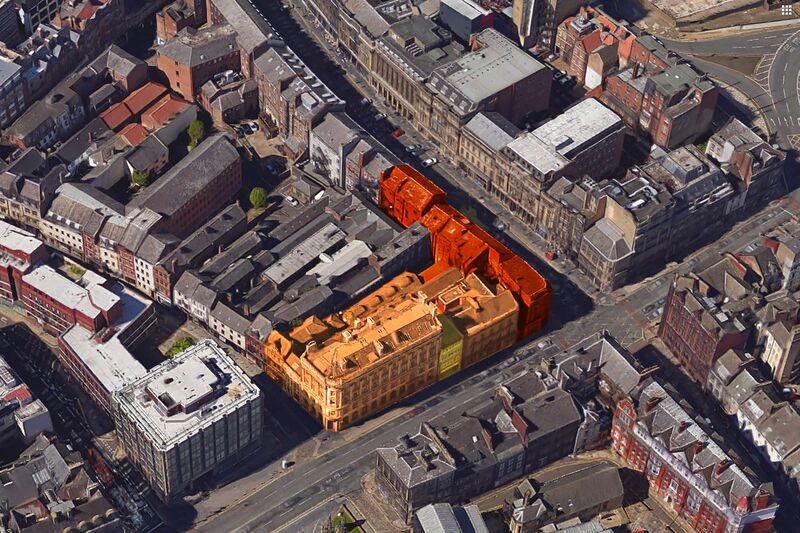 The Malhotra Group, which already maintains an impressive commercial property portfolio, has earmarked Grey Street for a major redevelopment scheme that intends to celebrate Newcastle’s unique historical assets and reinforce its status as one the UK’s best performing cities. Space Architects were originally appointed to design a 55-bed hotel for which they obtained full planning and listed building consent in one of the streets’ Grade II listed buildings, however, the Group has since purchased further surrounding buildings and in addition to the planned 4-star hotel, the vision has extended to include a luxury spa and health club with roof top swimming pool, high-end retail units, a nightclub and several restaurants. The redevelopment will encompass nine buildings in total, seven of which are Grade II listed and will retain the neoclassical design that this part of the city is so famous for. The scale of the project is immense and will contribute to the growing recognition of Newcastle as being a cosmopolitan and attractive city for international investment and tourism. Not only is the scheme set to become an important visitor destination, but it will also create new jobs and contribute to the city’s economic successes. It was back in the early 1800’s when the builder, Richard Grainger, along with architects John Dobson and Thomas Oliver redeveloped the centre of Newcastle using the neoclassical tradition. These elegant buildings that rise along the hill of Grey Street are a key part of Newcastle’s heritage and need to be preserved. Meenu Malhortra, CEO of Malhotra Group said: “We pride ourselves on our commitment to restoring iconic landmark buildings to their former glory and the Grey Street area is no exception. David Coundon, Director for Space Architects is leading the design team and is currently discussing the planning submission with Newcastle City Council and it is hoped that full planning permission will be granted in the Spring of 2018 as the council has warmly welcomed the vision for this regeneration project, and the jobs that will be created. Space Architects will soon be facilitating a conditions survey of the existing buildings, along with point cloud surveys which generate a 3D model of a building using laser technology. This will generate an interactive model image of the buildings, which will then form the basis for the design and will enable the team to fully analyse, review and consider the historic fabric, and more importantly, deliver the project on time, avoiding added costs.